26 Sep, 2014 Ello, it’s been brief but I’m leaving you for your own good. It’s not just Paul’s face, there’s also no mention of FreshTracks Capital and the $435,000 in venture capital that Ello took from them. 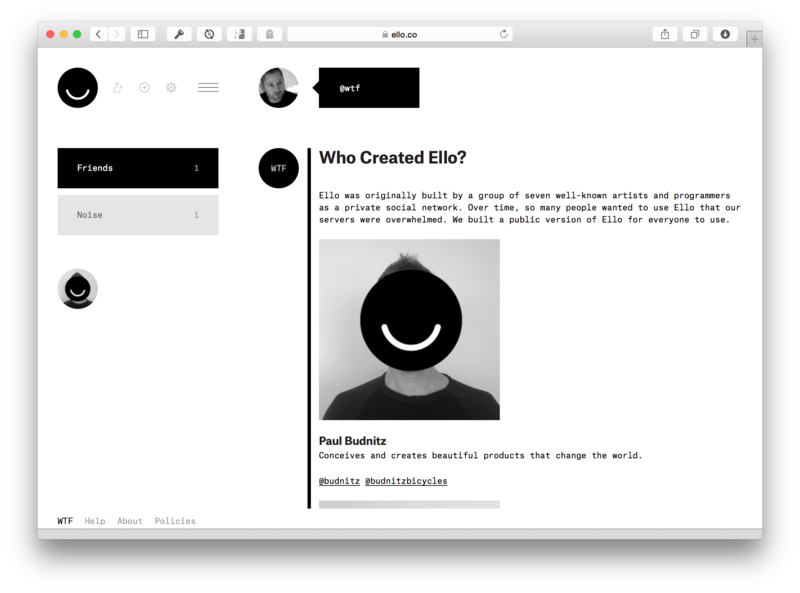 When Paul Budnitz, founder of Ello, got in touch with me around May, he told me in an email “We totally love your manifesto.” I was excited. Here was a designer leading a small group of artists and programmers who wanted to build a privacy-respecting alternative to Facebook. (Someone, no less, who made some gorgeous-looking bicycles.) When Paul asked if I’d be happy to chat and offer them advice — pro bono — I said sure, I’d be happy to try and help out a little independent group trying to do the right thing. A couple of Skype meetings followed. I told them I had worries that Ello was not free as in freedom and that it was centralised. I was assured they were aware that it was less than ideal but they simply didn’t have the resources to do it any other way at the moment. I tried to push them to open it up but I felt resistance that I (naïvely?) attributed to a lack of confidence in their code or fear that they may lose control. They seemed genuine in their desire to build an ad-free/privacy-respecting network and I felt like their hearts were in the right place. I knew Ello would not be the long-term solution we needed as it was closed and centralised but I thought it could be a good stopgap. What I didn’t know at the time was that they’d taken $435,000 in seed funding from FreshTracks Capital, a Vermont-based Venture Capital firm. This had apparently been announced by FreshTracks Capital in March. I still like to think that their hearts are in the right place (and, selfishly, that I’m not a terrible judge of character). They seem like great people and I enjoyed our conversations. I can only assume that they were naïve about what taking venture capital would mean for a project like this. Which, to put it bluntly, is the nail in its coffin. When you take venture capital, it is not a matter of if you’re going to sell your users, you already have. It’s called an exit plan. And no investor will give you venture capital without one. In the myopic and upside-down world of venture capital, exits precede the building of the actual thing itself. It would be a comedy if the repercussions of this toxic system were not so tragic. A venture-capital funded startup is a temporary company that has to convince enough people into using their platform so that they can make good on the exit they promised their investors at the very beginning. It is the opposite of a long-term, sustainable business. And so it is doubly disappointing and worrying that Ello doesn’t mention that they are venture capital funded anywhere on their About page. Instead, as Andy Baio points out in his post on Ello, “[t]he About section makes it seem like Ello was built independently”. Before they opened their doors, Ello became hooked on an unsustainable funding model — taking cash from VCs — and will almost certainly take a much larger Series A round once that $435,000 dries up … Ello will inevitably be pushed towards profitability and an exit, even if it compromises their current values. The only way to fight the venture capital model is not to support the product in the first place. Venture capital is private subsidy that keeps the startup alive long enough until enough people have joined their platform. At this point, it’s too late. By being part of the platform we have created its value. This is the value that is sold in an exit. The only way to resist this system is to not build that value in the first place. Once a network has grown to the sort of size Facebook or Twitter has, there is very little anyone can do. But we have an opportunity to make sure that new networks that are funded by venture capital do not reach that point. I’m sorry, Paul, but by taking venture capital you have made a crucial mistake that is incompatible with the goals you set out in your manifesto and I will not support yet another venture-capital funded network only to be disappointed at the time of the inevitable exit. So here’s what I’m doing: I’m leaving Ello. Before it can grow. Before it can exit. And I suggest that you do the same. Or, even better, do not join it in the first place.